Egg custard tart is one of my favorite items at dim sum. I've always been fond of eggy desserts like creme caramel, creme brulee, flan. It's especially good when it is fresh out of the oven -- hence dim sum is a great place to get it. It's not always easy to get it so freshly made at bakeries. The concept is quite easy. An egg and milk based custard is baked into a tart shell. There are about three different tart shells. One is a puff pastry, with layers of thin and crispy crusts. Another is made like the sweet tart dough (Pate Sucree), which is crumbly and sweeter. A third kind of dough is more like a pie dough (Pate Brisee), not sweet, and the sides are braided. The filling contains mainly eggs, milk, flavoring, and sugar. Yolks contribute creaminess and richness. The albumin in egg white and proteins in milk help the custard set (solidify). There is always a risk of overheating a custard and curdling it. Adding starch like cornstarch or flour can insure against curdling, but the smooth consistency of a custard can be greatly diminished by it. My favorite tart dough for egg tarts is puff pastry. I like its crispy texture contrasting against the custard. Portuguese egg tart is unique in its puff pastry dough and caramelized top. They were supposed to have originated from Macao, and were later widely distributed by KFC in Asia. They attracted huge popularity for a short period of time in Taiwan. For a while every block in Taipei had at least 2 vendors for Portuguese egg tarts. Its oversaturation soon lost the ever-changing appetite of the Taiwanese people, and most vendors soon closed their doors. After passing by it several times and hearing about it from Erica, I finally visited this little cafe. Egg Custard King Cafe (蛋塔王) in Chinatown is a small pastry/drinks shop in a basement space that used to be occupied by Sweet n' Tart. There are other pastries, but their specialty of course is their egg tarts. I bought every flavor to try (well, except their swallow's nest 燕窩 flavor... WTF??) and I really just like their original flavor. It's eggy and on the sweeter side to my liking. All of their tarts have the same puff pastry shell. The banana flavor is bad, using the very common (and odd) banana flavoring. Honeydew and strawberry flavors are not pronounced, and tasted really weird with the eggs. The almond flavor was nice, but the texture of the custard is very gooey, and kind of sticks to the tongue -- not very pleasant. It probably has some starch in it. The egg white tart is pretty good actually, but I prefer to have the yolk in there. If you don't eat the tarts right away, you can still store them in the fridge for a few days. Just pop them into a 350F oven for 10-15 minutes before enjoying them. Don't microwave them, as the crust gets soggy, and the uneven microwave heating may explode the custard. i love portuguese egg tart. the funny thing is that when my dad and i were in macao a few years ago, we could not find portuguese egg tart anywhere on the island. we thought they'd be everywhere. finally, we walked into one small mom/pop bakery shop in an alley, and they had one portuguese tart left. so i had to split it with my dad. and it tasted the same as the ones we've had in nyc. what a let down! Yeah! you at least tried the egg white one, Jennifer and I love that one the most, and she loves the almond one too, I am so so. I agree the original is still the best, but for some reason, I am an egg white person so I was pleasantly surprised to see the egg white version. I bought other pastries from them, cookies and stuff, they were alright, nothing to rave or complain about. In the fall of 2004, I went went to study abroad in Syndey, Australia. While I was there, I worked at the school's cafe where we sold Portuguese Custard Tarts(egg tarts). Coming from Mexico and Texas, I had never seen/tasted them before and when I did, Oh My Gosh! Instantaneously, they were my favorite. Hi! 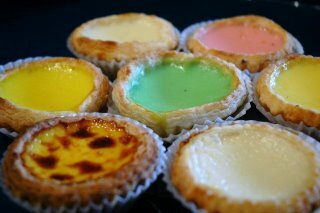 I am a huge fan of portuguese egg tart, and i love the picture you shot! may i ask what are the different flavours cos I see different colours. What does the egg white version taste like? is it as rich as the common one? Thanks Vanessa for the recipe Vanessa! I'll definitely try it out. As for the flavors, I noted them in the caption under the picture.